Talk about chocolate and the kids are ecstatic! 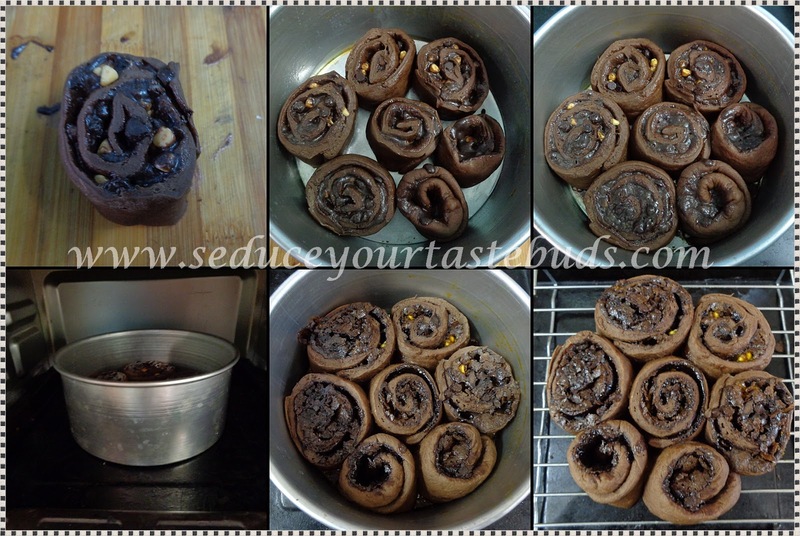 So when Shireen chose Breads with Cocoa,Cacao or Carob in any form as the theme for #BreadBakers, I knew the kids would love anything that is getting baked for the theme. This is one over dose of chocolate!There is chocolate in the buns, in the filling and even drizzled with chocolate! Need I tell you how the kids reacted when they saw these buns!? but not boiling. Pour this liquid into a large bowl and add the butter. the yeast will proof. If it is too hot, it will kill the yeast. 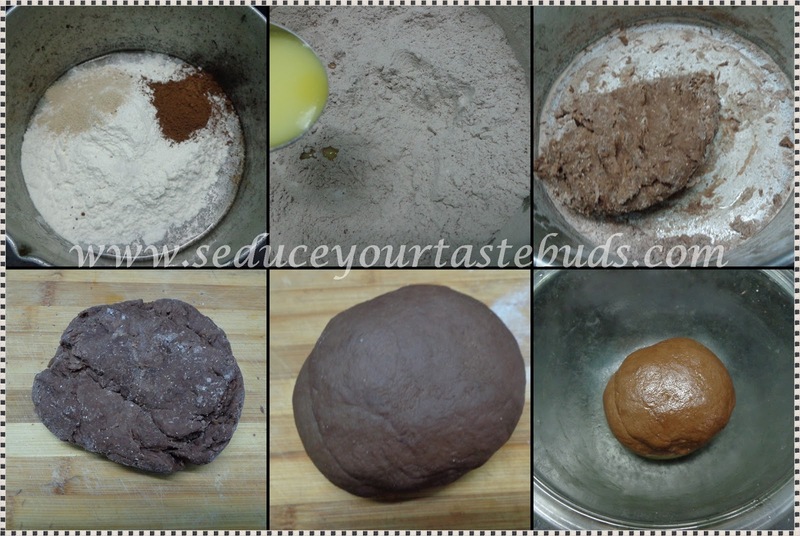 In another bowl, take the flour, cocoa powder, salt,yeast.And mix well. Add the warm milk mixture.Knead. Transfer onto a work surface and knead well for 10 minutes till the dough is smooth and elastic. 1 – 1 1/2 hours. it out into an approximately 9″ by 12″ rectangle. 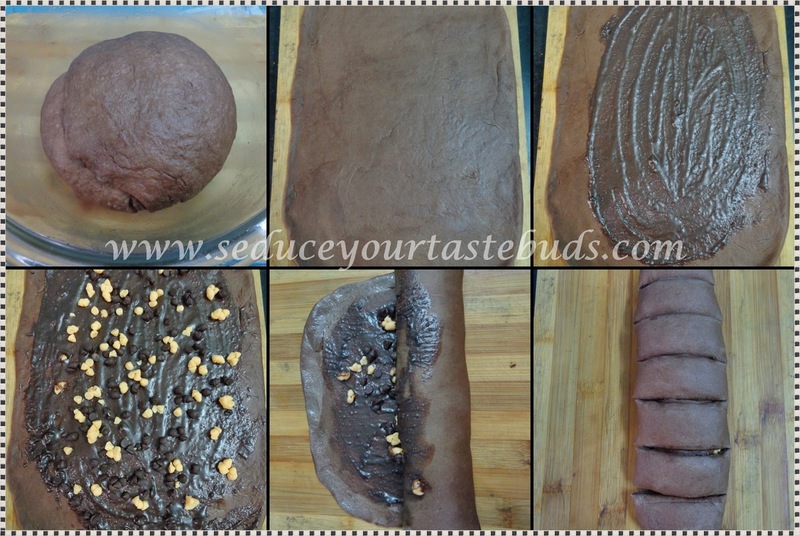 Spread chocolate sauce / chocolate frosting on the surface and sprinkle the chocolate chips evenly. edge with a little water to seal well. wide pieces with a very sharp knife/ dough scraper. Cut into 6 equal pieces. to rise, for about 1 hour or till almost double. 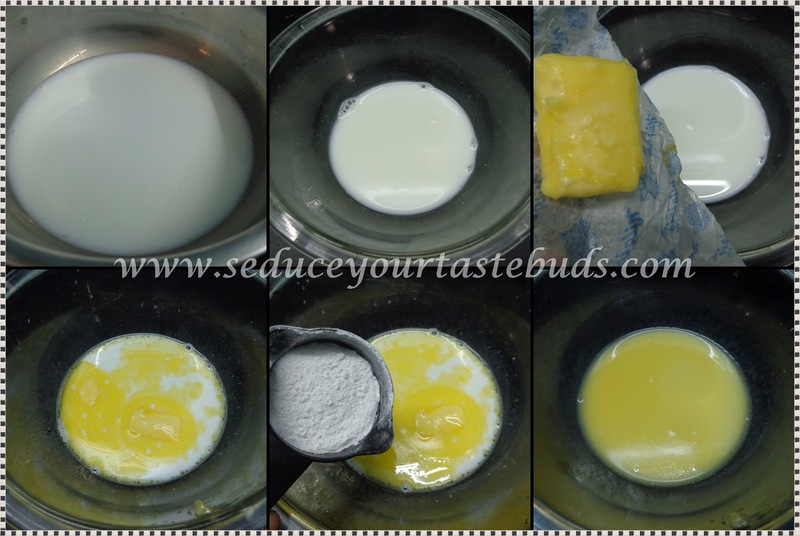 Bake at 180C for 25 – 30 minutes. Remove from oven and cool completely. These buns would be a great treat anytime! Wow, buns look so inviting and delicious! These buns look so tender and delicious! No egg is a plus! Wow, way to embrace the theme with three different applications of chocolate. Great job. Wow those chocolate buns sure have an overdoes of chocolate, but who's complaining. Can I have 2 please?? How can you go wrong with chocolate? Right? So chocolatey, that's its really tempting.